Mother’s Day Brunch @ The Queen Mary: The Queen Mary - making moms happy since 1934. Mother’s Day Brunch @ The Queen Mary The Queen Mary - making moms happy since 1934. 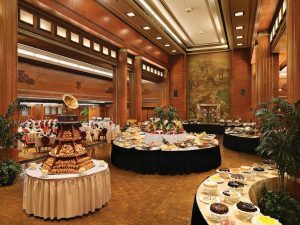 A local favorite, the Queen Mary Champagne Sunday Brunch takes you on a worldwide culinary adventure and features over 50 unique dishes from around the globe. Delight in traditional western breakfast fare like made-to-order omelets, pancakes, eggs benedict and homemade hash. Experience a southwestern sensation with Albondigas soup and carne asada tacos, or spice it up with Hot n’ Sour soup or Asian style ribs. Cleanse your palate at our refreshing salad station featuring a chef crafted Cobb salad, imported tuna nicoise and a variety of domestic and imported cheeses. The highlight is our signature carving station, which offers perfectly prepared prime rib with au jus and leg of lamb with mint jus. Parking: Self-parking is $8 with validation/Valet parking is $15 with validation (up to 3 hours). Reservations: Strongly recommended – Call 562-499-1606 or Visit http://www.queenmary.com/dining-bars/reservations/ to make a reservation now. Parking: Self-parking is $8 with validation and valet parking is $15 with validation (up to 3 hours). 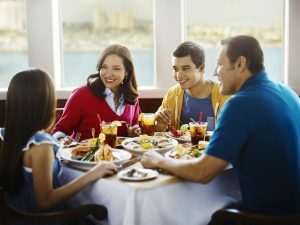 Reservations: http://www.queenmary.com/dining-bars/reservations/ or call 562-499-1685.